In accordance with the principle of extended producer responsibility, Insis d.o.o. implements its obligations which derive from the 2002/96/EC and 2006/66/EC European directives “Regulation on waste electrical and electronic equipment” (Official Gazette of the Republic of Slovenia, No. 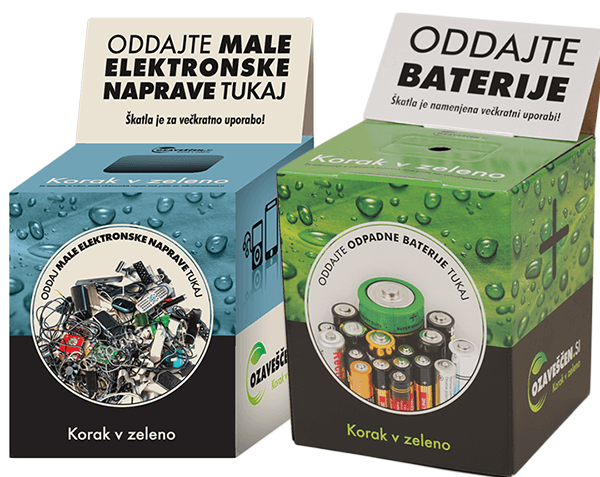 55/2015) and “Decree on the handling of batteries and accumulators and waste batteries and accumulators” (Official Gazette of the Republic of Slovenia, No. 3/2010, 64/2012, 93/2012) in the framework of common plans for the management of waste electrical and electronic equipment, batteries and accumulators of the company TRIGANA d.o.o. The symbol of a crossed-out container on the item, its packaging or in the instruction manual means that the device must not be disposed of into mixed municipal waste and that it was put on market after 13 August 2005. It is your duty to bring it to special collection points for separate waste collection within the framework of the local utility service. You can also bring a waste product or appliance directly to a retailer or distributor when buying a similar product. By doing so, you fulfil your legal obligations and contribute to the protection of environment. Separate collection and recycling of WEEE prevents the development of negative consequences of environmental pollution and health hazards which may occur due to inadequate waste product disposal. Additionally, it enables the processing of materials from which the latter product is made, and conserving energy and natural resources. If the product you want to discard is still functional, bring it to one of the reuse centres. This way you’ll prolong its service life and ensure that it doesn’t end up at the dump prematurely. The symbol of a crossed-out container on batteries and accumulators, their packaging or in the instruction manual means that the batteries and accumulators must not be disposed of into mixed municipal waste. It is your duty to bring them to special collection points for separate hazardous waste collection within the framework of the local utility service. You can also bring waste batteries and accumulators to a retailer or distributor without repurchase obligation. By doing so, you fulfil your legal obligations and contribute to the protection of environment. If a chemical symbol is printed below the symbol shown above, it indicates (according to the legislation) that the battery or accumulator contains a heavy metal (Hg = mercury, Cd = cadmium, Pb = lead) in a higher quantity than stipulated by the legislation. If the device contains batteries or accumulators which cannot be easily removed without putting the user in danger, they must be brought to the appropriate system of waste electrical and electronic equipment collection together with the device. Think green and take a look at the website www.ozavescen.si. Get more detailed information on recycling waste products, appliances, batteries, accumulators and other waste. A list of collection centres of utility companies is available on the website, as well as the information on reuse centres to which you can bring devices and appliances that are still functional. We are extremely thoughtful of the environment, so besides computers and laptops, you can also bring us other electronic devices such as batteries, chargers etc.